It has been over twenty years since Punch-Out first made its console debut on the NES, and over fifteen years since we last saw the series on the SNES. Just when you may have thought this franchise was down for the count, Nintendo has brought Little Mac and the gang out of retirement in Punch-Out! !, for the Nintendo Wii. In this installment, developer Next Level Games takes a swing at keeping this franchise the undisputed heavyweight champ that it has been for the past two decades. Together Nintendo and Next Level Games have made an experience as addictive and challenging as the original. It does not stray far enough away from the original formula for some gamers, but I believe that to be a secondary issue when the game is as enjoyable as Punch-Out!!. In Career Mode you must fight your way through the ranks of the Minor Circuit, Major Circuit, and World Circuit in order to hoist that final championship belt. Just as with the original, you will learn quickly you cannot button mash your way to victory. As the game progresses, you will need to have a carefully executed plan for each opponent. Specifically timed dodges, ducks, and blocks will be the only way to survive. You will not always take out your fellow pugilist on the first try, but as you learn his tells and weaknesses you will become much more successful. In Punch-Out!! skill wins over brute force every time. Strong Points: Addictive game play with precise NES style controls; Terrific graphics for a Wii title. Weak Points: Motion controls / balance board support not up to par; The game may be too similar to the NES version for some gamers. Moral Warnings: This is a boxing game with bruises, bumps, and knockouts but no blood or anything gruesome. After battling your way through all the contenders in Career Mode the game is far from over. Next, you will have to defend your title in the aptly named Title Defense Mode. Now, you will find each opponent has some new tricks up his sleeve. Each boxer will have new moves you need to get accustomed to, and may have new methods of defense to protect his previously vulnerable areas. If a boxer is giving you trouble, you can head over to the Exhibition Mode where Doc Louis will let you fight a hologram version of the boxer. This hologram will fight you just as the fighter normally would, but you won’t take any damage. After you learn the proper technique you can go back to take the real boxer down. Even after you beat a fighter in Career Mode you can face off against him in Exhibition Mode to conquer the three challenges per fighter. These challenges give another level of depth to fighting each opponent again. Some of the challenges are quite inventive, but others are unnecessary. I loved how this mode forced me to learn the absolute best way to defeat some opponents, but I still have a bad taste in my mouth from the first challenge where I needed to lose to Glass Joe. Punch-Out!! 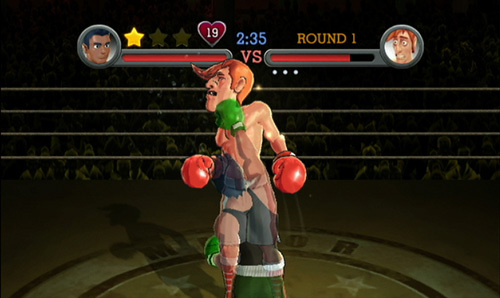 on the Wii is the first Punch-Out game to have a multiplayer mode. Sadly, there is no online support for multiplayer, but local multiplayer does add a new dynamic to the game. In Head to Head Mode both you and your opponent are Little Mac. As you dominate your opponent you will eventually be turned into Giga Mac. 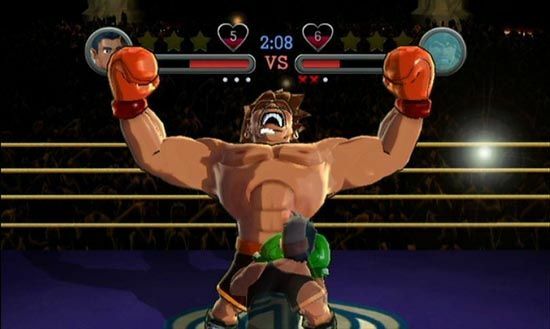 When you or your opponent turns into this Hulk-like version of Little Mac, the game screen will switch from split screen to the normal single player view while you fight off this giant. It is fun to beat down on your buddies but it loses some of what Punch-Out!! is since it is far less strategic than the single player modes. In any of the previously mentioned game modes you will fight a three round bout with three different ways to win. First, once you duck, dodge, and punch your way to knocking your opponent down he will have ten seconds to get up. If he does not get up in that time period you win by knockout (KO). Second, if you knockdown your opponent three times in the same round you get to watch a sweet animation and win by technical knockout (TKO). Lastly, if you make it all the way to the end of round three a winner will be named by decision. Besides watching your opponents tells and patterns there are other items you need to keep an eye on. Both you and your rival have a health bar called a Stamina Meter. If your meter goes down to zero you will be knocked down and hit the mat. Always keep an eye on these meters, especially when you have knocked down your opponent twice in a round and are going for a TKO. Unlike most fighting games, you will not only have a Stamina Meter, but also a Heart Meter. As long as this meter is at one or more you can continue to throw punches. Each time your punch gets blocked, or you get hit, this meter will go down. If it goes down to zero you will temporarily turn purple, and be too tired to swing. If you are turning purple often, time your punches to make them count instead of flailing wildly. One of my favorite aspects of the Punchout series is star power. For each contender you face there will be a split second for you to pop him and gain star power. This can happen when the fighter is taunting you, not paying attention, or just before they unleash a major hit. If you hit him at just the right moment you will gain a star. When you have a star you can press “A” while you punch to unleash a major hit. You need to make sure you do not waste these stars because you normally will not receive many in a fight. You can hold three stars at one time but don’t hold them too long because if you get hit all of your unused stars go away. It may take several tries to figure out when you can get a hit for star power. If you are having a hard time figuring it out always listen to Doc in between round. Some of what he says is nonsense about chocolate, but other times it can be a well-deserved clue. I really like star power because your opponents are usually much stronger than you are and deal a lot of damage. It is nice to return the favor every once in a while. For any old school gamers out there, one of the first things you will notice when you play Punch-Out!! on the Wii is its surprisingly similar to the original game. Not only are the characters practically the exact line up in a different order, but strategies to beat them are similar to 20 years ago. This isn’t necessarily a bad thing, but one would have expected a bit more variation from the NES version. In my eyes we can look at this one of two ways, but the real answer is probably somewhere in the middle. First, the fact that the game play is unchanged is a testament to how truly great the original was. Second, the developer was afraid of alienating the NES gamers by messing with the classic formula too much. While I wish there was a way for the game to be both classic and fresh, if we had to choose just one, staying true to the game’s roots is the way to go. For anyone who has the NES game memorized there is still a good deal of challenge to be found here. You may breeze through parts of the Career Mode, but don’t get too cocky because some of the fighters’ moves are changed just enough to keep you on your toes. In the end, even if Career Mode is not the challenge you were looking for, Title Defense Mode will give you a run for your money. In this game precision is everything. You have to learn your opponent’s tells and then react at just the right moment. When a game demands such a high level of accuracy the controls must be flawless. This title offers a few different controller setups. First, you can play NES style with the wiimote on its side. Second, if you plug in the nunchuck you will be able to use motion controls to throw your punches. Lastly, you can add in the Wii Balance Board to dodge your opponent’s attacks. Out of pure curiosity, I started out with the motion control setup of the wiimote and nunchuck. I was able to take down several fighters using this control scheme. I had no issues with the motion controls themselves, but the control stick on the nunchuck was not as precise as it needed to be. The game gets less and less forgiving as it progresses, and when “up” on the nunchuck was only registering half the time, I just couldn’t win. Once I switched over to the sideways wiimote, things worked much better. In this switch I lost the workout of motion controls but I gained the precision this game requires. Addition of the balance board sounds good in theory but is rather frustrating in practice. I would have liked to see the option to use the classic controller, but truth be told I would have stuck with the wiimote in all likelihood. Visuals in this game are top notch for the Wii and fit the game’s style quite nicely. Had the game played more like a boxing simulator, then I would expect the graphics to be as real as possible, but since the game plays more like a puzzle game, the cartoonish style works well. Before each fight you will see animated stills telling you a bit of background about each fighter. These stills look great and give you a way to connect to the story even when the game is loading, but each time they pop up I thought a cut scene might have been the way to go. The audio and voice acting in Punch-Out!! did its job well. A pet peeve I have had with Wii games is when I click on the game from the Wii menu there is usually an overly loud, borderline obnoxious, audio cue that comes up, and this game is no different. That aside, the in game audio is done well. The only complaint I have is in the grunts, sayings, and tells during a fight repeat over and over again. This gets a bit old especially when you end up fighting the same boxer a dozen times. Where I was quite surprised was in some of the game’s voice acting. I assumed a fighter from a foreign country would speak English with a thick accent, but instead he speaks the language of his home country. Even though I do not know what some of my opponents are saying, I like the decision to have each fighter speak in his native tongue. This is a boxing game, but it is about as clean as a boxing game can be. It is rated E 10+ because of cartoon violence and comic mischief. There is fighting, but no blood, broken bones, or anything gruesome. You will see bruises and bumps on the boxers as the match progresses but these cartoonish wounds are nothing worse than what you would see in a 1950’s episode of Looney Tunes. TKO’s are often in slow motion and can be a bit more graphic. As you are introduced to each boxer you will see each is an overly dramatized stereotype. None of the characters are outright offensive but they may not properly portray the people of that country. These caricatures of the people the fighters represent may a stumbling block for those who are sensitive to such issues. Taunting and showboating takes place throughout the game, but I feel it just gives you more justification to knock the guy down. You will see crude humor from time to time, such as burping. Magic does not play a significant role in this game but the argument could be made that magic is used by the Great Tiger. There is not much of a sexual element in this game but each fighter you face will be shirtless. Some fight in what looks to be underwear and another will drop his pants to reveal his boxer shorts throughout the match. This game is one that any Wii owner should add to his/her collection. Recently Punch-Out!! has been made a Nintendo Select game. This game was a good buy at the original MSRP of $49.99, but now it is an absolute steal at $19.99. It is amazing how well the core Punch-Out game play has held up all these years. In a time period when we toss out our sports games each year for the new installment, it is refreshing to know that I can hold on to this title and it should be just as solid in another twenty years. In the end Punch-Out!! has a cute exterior yet a demand for razor sharp precision. It truly does float like a butterfly and sting like a bee.